It's Friday again and another Polkadoodle Challenge! Hi, Lou here and it was my turn to set the challenge this week and I chose . 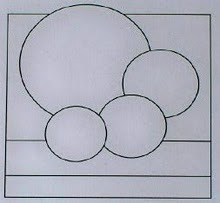 . . create a Shaped Card. So this is this weeks challenge and also your challenge (should you accept!) for this week. The closing date is Sunday 7 March at 12noon GMT and please remember that the maximum number of challenges to be linked with is 10. Please contact Nikky for further details and your blinkies. Congratulations! This is our last week with our February Guest Designer Teri. 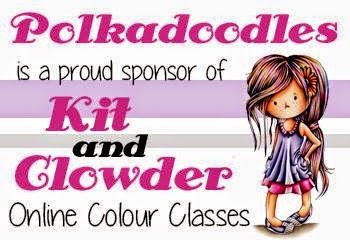 Thank you so much for being part of the Polkadoodle team, we've enjoyed your company! Here is what Teri had to say about her card . 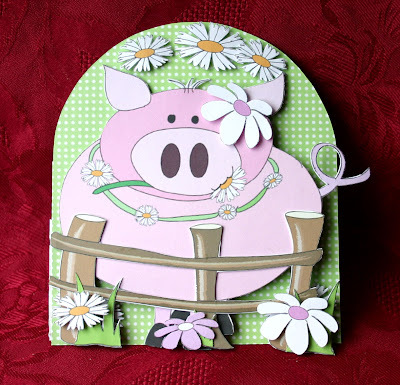 . .
"I just had to use my namesake Sherman for this shaped card! I teamed him up with other bits and pieces from the shaped section on Back To Nature. It's been a pleasure being your 'guest' this month and great fun too. Many many thanks!" and from the side, showing all the layers. 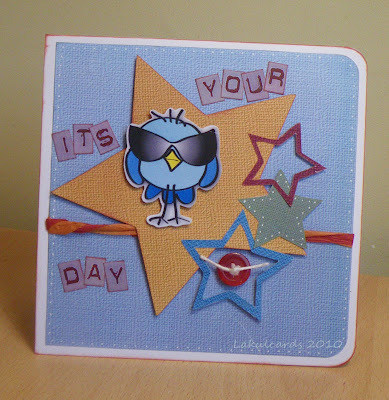 Kris: Well I went with a very simple triangle shaped card and in keeping with trying to use up my scraps I have real mix of thing here...Candle Doodles, Sugar Birdies, Back to Nature and even a little owl from Love and Chrish. I think they all compliment each other vey well. Brenda: I created the shaped card using Cricut Storybook and Plantin Schoolbook, welding the elements together in Design Studio. The paper is from the Love and Cherish CD, sentiment from the Back to Nature rubber stamp sheet and the flower made with punches and spritzed with Glimmer Mists to add glitz. Ruth: I've used probably my most favourite image of all time (so far!) 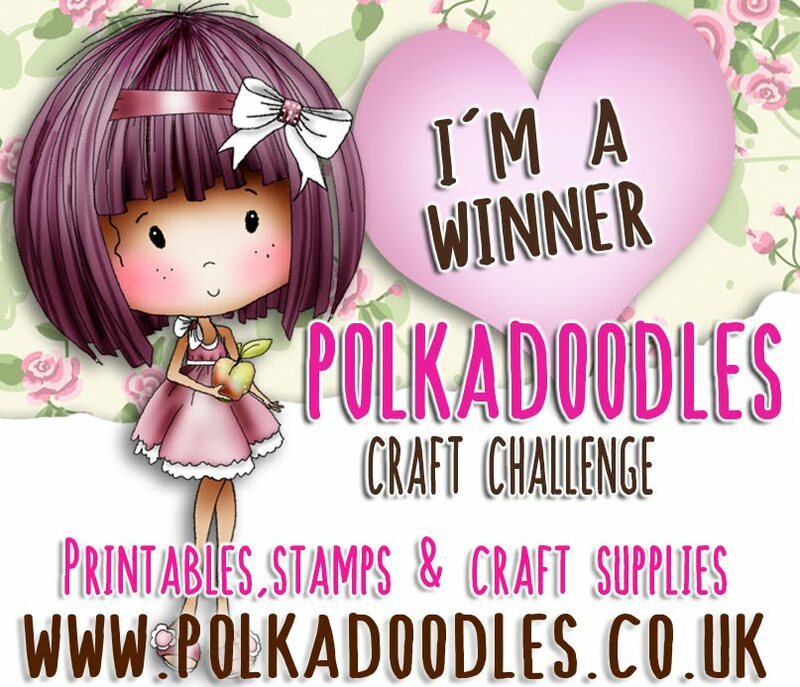 from Polkadoodles - it just has to be the decoupage chocolate cupcake from Candy Doodles! I've printed all the elements and layered them up adding a bit of glitter glue to the bow. The letters are also from the same cd. 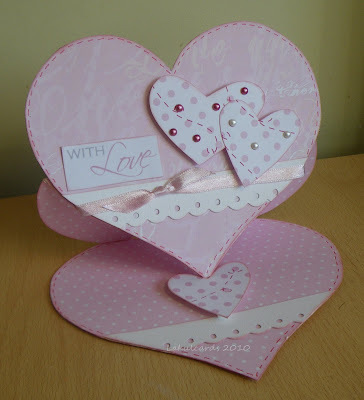 Kerry - Easel cards are so popular at the moment, so I had a go at making a heart shaped one. Had a bit of a nightmare as I managed to get glue over the base, but thankfully it doesn't show. I used the Heart to Heart papers from the Love and Cherish CD, a few half pearls, plus a bit of faux stitching to match the hearts. 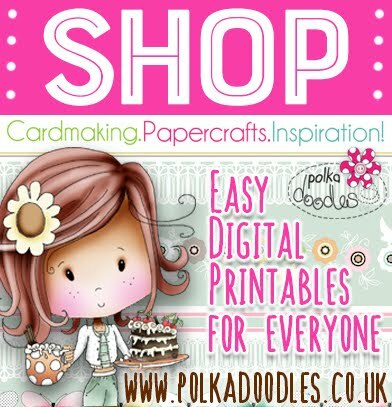 Claire: I am also going for one of the fab new shaped cards from Paper Boutique. Funky Munky is just georgeous and I have given him some flocking fur and heat embossed his banana (not as painful as it sounds) and foliage...great fun! 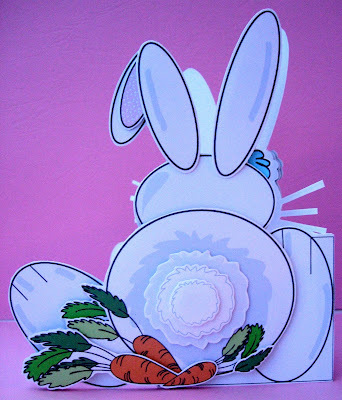 Fliss : I've gone for the brand new Paper Boutique CD too as I just couldn't resist this gorgeous bunny which is going to be a real favourite with my family who all adore rabbits. 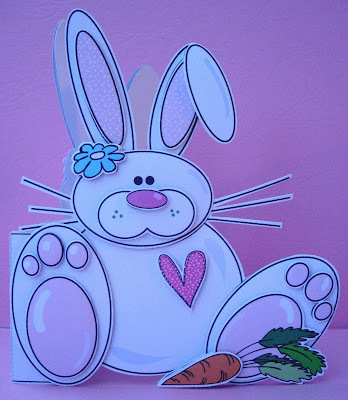 I simply printed out the A5 size shaped bunny and decoupage elements and layered them all up to make this cute card. Don't you just love that fluffy tail! 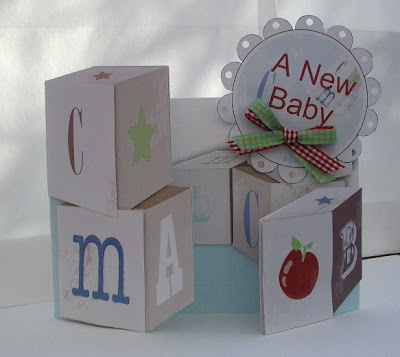 Dolly: I've used a template from Papercraft Boutique and made the Building Blocks Card in A4 size. Lots of layers to decoupage and I've added glamour dust and glossy accents here and there for definition. Lou: I know that I set this weeks challenge and I promise that I was going to make this large A4 sized boys cake card for my nephew, when sister asked if I could make a brag book for his birthday instead . . so this is what I came up with. Now I know it's not a card but it is shaped . . . am I forgiven now? The book was made using a template from the new Papercraft Boutique CD. We can't wait to see what shape you will use for your project this week . . . getting excited already! Happy Friday everyone! It’s Kris here today all the way from the good old USA. I’ve got the winners from the paper piecing challenge and I’m asking each and every one of you to join in this week’s fun. I’ve drawn a sketch (well, kind of!) and called a theme…“For the Birds”. All you have to do is show us your interpretation of the sketch and put a birdie on there somewhere. Please remember to follow the rules - no more than 10 challenges for your entry here. Please contact Nikky for further details and your blinkies! Congratulations! Up first is our fabulous February guest designer, Teri. "I used the Peacock section from Back To Nature for this project. Such glorious colours! I hope I did it justice...?" Er, yes you did! Kris: Wouldn't it be funny if I couldn't follow my own sketch? Anyway, I used the owls from Back to Nature as my birds. The other patterned papers are Picnic Brights and a strip from the topper sheet (all from BtN). For the flowers I printed the paper and then ran it through the printer again with some of the Stampie flowers from Sugar Birdies. I added some doodling and the little sentiment is a rub-on. Brenda :I used the Love and Cherish CD for the background paper, re-sized the lovebirds from the same CD, printed them five time and cut with nesties to create a pyramage. 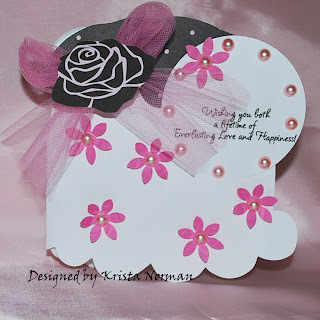 Roses made from plain pink paper and glittered and border using a Martha Stewart punch. Kerry - A lovely sketch this week from Kris and we also had to use any bird from any Polkadoodles CD on our card. The “Not for Girls” CD came out for this one. These textured papers are so good and are so effective. The stars were cut out with my Cricut. Sorry about the wonky photo!! Kate: I have used the Not for Girls cd for this one as i think these birds are just the coolest ! 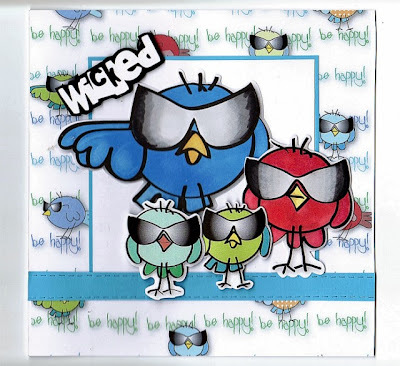 I cut the "wicked " logo on my cricut .Two of the birds were pre coloured one ,the others i coloured myself with promarkers. Ruth: It's a case of needed to make some baby cards as it seems that there are a lot of babies due over the summer! Not mine I hasten to add but a lot of my friends are expecting, so I need to be prepared! Used Candy Doodles for all the papers and the little birdie from Sugar Birdies which I've enlarged and used as the template. A bit of doodling (to hide the glue if I'm honest!) and a little flower, some wire and gems and its completed! More details are on my blog! 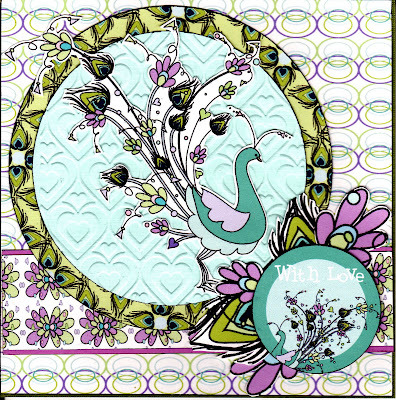 Fliss: I've also used the Shake a Tail Feather collection from the Back to Nature CD as the colours on it are my favourite combination so couldn't resist returning to it for Kris's sketch challenge. I've used lots of layers and inked all the edges to make the pieces pop out. I added a decupaged peacock, one of the lovely matching sentiments and some flowers cut from one of the gorgeous papers to finish. 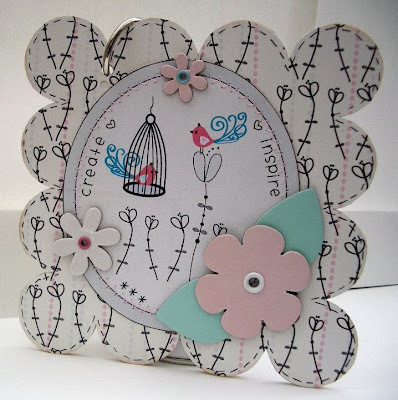 Dolly: I've used the Lovebirds collection from Love and Cherish to make a notebook cover. Just added some chipboard flowers and eyelets to 'jazz' it up a bit. Lou - I have used oodles of papers & elements from the Candy Doodles CD which have been layered & chalked. Paper ribbons added to the bottom which have been secretly stapled into place ! I'd like to see hearts, flowers or a mixture of both. Most of all just have some fun! 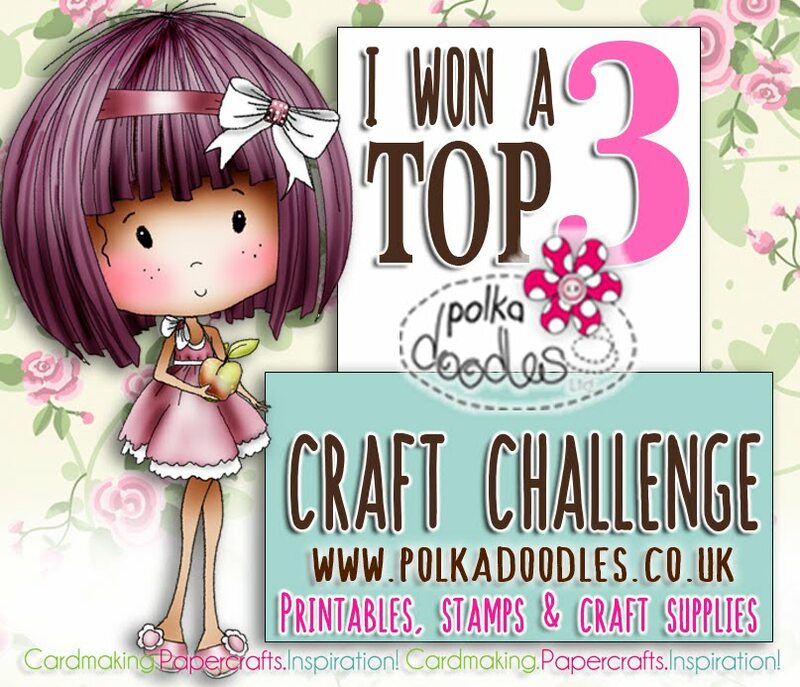 Remember to be in with a chance of winning a Polka Doodles prize all we ask is that you enter your project in no more than 10 challenges including this one. 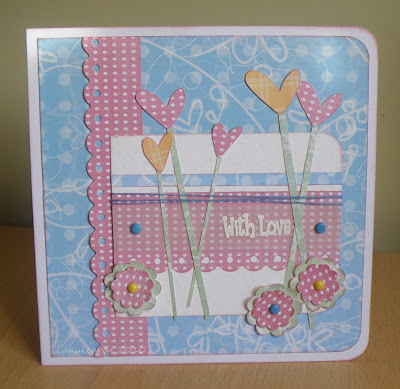 Our lovely Guest Designer Teri has done a great take on this week's challenge..."I made a heart shaped box and used the stackies flowers on it. Hope it will do for you!!" Well...ok then, Teri, we think this is gorge! Kris: I've used Love & Cherish for the main paper and then cut flowers from the Sugar Birdies CD. Not one bit of extra coloring this one but I did add some stickers to spell the word LOVE down the center and the hearts cut out of the red border to scatter around. Enfys: A lot of hearts but not many flowers on mine, but I reckoned that as the floating hearts look like a bunch of flowers, I could get away with it - well that's my excuse! I printed the paper out twice from the Love and Cherish cd, then cut out the hearts and popped them on with foam pads. A lot of bling and I was done! Ruth: I've used a welly boot template, covered it with spotty paper from Sugar Birdies and printed some of the flowers at A5 size, curled the edges, added buttons and jute string and then glued them to the boot. I've used chalks and ink to create shading and depth. Brenda - I have used the Boundless Love section of Love and Cherish CD - probably my favourite section of the CD as I adore the swirls and colours. I printed two sheets so I could cut out and decoupage the flowers and leaves, used one of the toppers and glittered the heart, then finally added some gems and a simple 'I love you' sentiment. Kerry - I’ve been exploring what's on my Cricut cartridges and saw these hat pins on Opposites Attract. I thought they looked great as little heart flowers plus I made some flowers to match using some Cuttlebug dies. The papers are from the Back to Nature CD. Kate: Lots of flowers and not so many hearts (they are hiding on the tag ) for me I used the flower stackies from Back to nature and the bridal couple and background paper from love and cherish.I coloured the couple with promarkers and glittered her veil and tiara with a sakura gel pen. 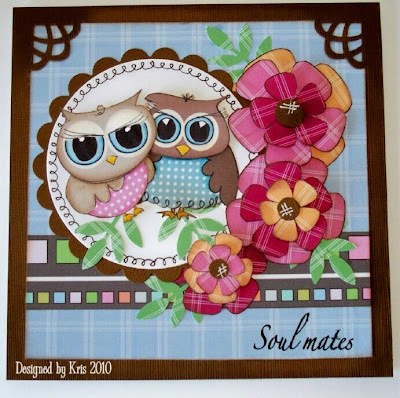 Claire - I am enjoying playing with a circle easel card this week and decided that the owls with hearts and a few flowers from the Love & Cherish CD would be ideal, I have layered flowers with a heart brad in centre - a great romantic combination! 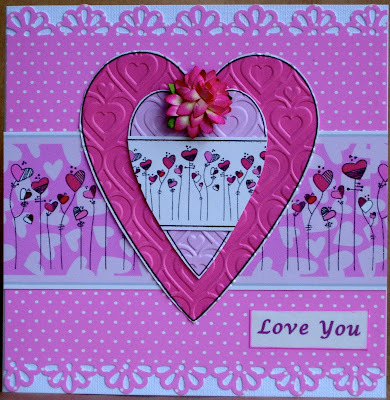 Fliss: All in the pink for me this time using the gorgeous hearts papers and cut out hearts from the Love & Cherish CD. I've embossed my cut out hearts with a Cuttlebug folder and layered them up with some of the pretty heart border strips. The polka dot background paper has been edged with a Martha Stewart border punch and a flower and sentiment added to finish. 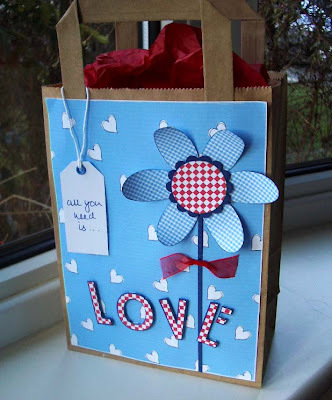 Dolly: I’ve used a mix of CDs to create this gift bag. Just love this red check paper I’ve discovered on Sugar Birdies. The black outline letters are from Back to Nature, printed on to patterned paper and layered on blue card and foam pads for some definition. The flower template is from Love and Cherish. Krista...I made a cake shape card..I used the love and Cherish CD. I just heart that flower paper, so I cut out the one flower I needed. Lots of embossing. 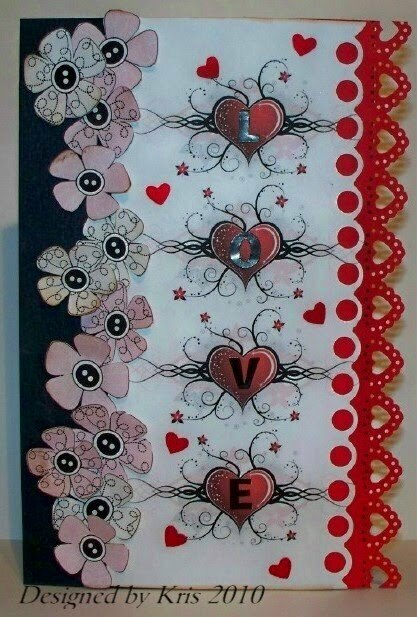 Nettie: I love these papers from the Love and Cherish CD, black and red are so striking. I have used the set to make a wallet style Wedding Invitation. 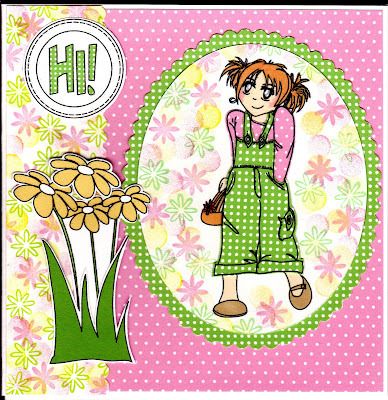 Lou : I have used the cute Daisy papers from the Love & Cherish CD, backed onto the scrummy Picnic Bright papers from the Back to Nature CD. 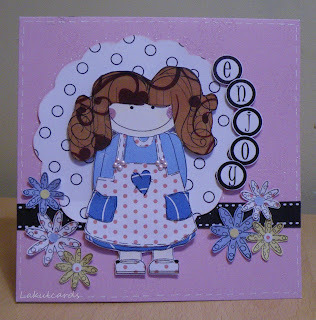 The card has been stamped with the flower stamps from the Daisy Doodles collection & they have been lightly chalked. Hand cut the large hearts from the same papers & layered on top of each other. Finally finished with organza ribbon & sentiment. The deadline for challenge entries is Sunday 21 February at 12noon - please add a direct link to your creation with Mr Linky below! Good luck! PS We've had a few technical issues with Mr Blogger this week, so if this post looks a bit odd you know why! 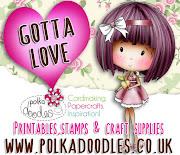 Hi, hope everyone has had a doodletastic week! Claire here, its my turn to set you a challenge - how fun! I love paper piecing, I have to say it is possibly my next favourite thing to chocolate and my family and friends (I should say not in that order). For anyone who isn't sure what the Paper Piecing technique is, you basically stamp the same image onto different papers and then cut out different parts of the image from each one to make up the final design. Obviously when you use CD's or digital images this is easier as you can just print your image onto the papers and then cut them out. 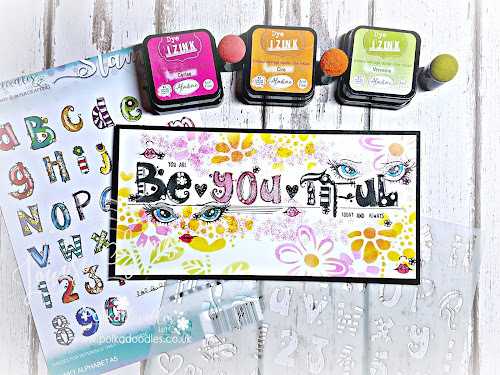 It's a great way of getting different looks to the same stamp design and adding textures etc. The most important thing to remember is have fun, we will all enjoy visiting you and seeing your creations. Please bear in mind that to be considered for a prize you should combine no more then 10 challenges (including Polkadoodles). Please email Nikky for further details and blinkies! Congratulations! Our Guest Designer for February is the lovely Teri, who I'm sure you are all familiar with. We love Teri's work so we asked her to do her own spin our challenges throughout the month, and she'll be using the Back To Nature CD. "I've never really done much paper piecing before so this was a newie for me", funny Teri, we would never have guessed, this is lovely! Enfys - For mine I could not resist giving her some gingham dungarees, love this paper. All the papers I used are from Back To Nature. My random stitching around the edge is fake, I did the stitches with an unthreaded sewing machine on the back of the paper and then joined the dots. Ruth: For mine I have enlarged one of the cupcakes from Love and Cherish and the papers too. I've cut the papers and then embellished them with tiny seed beads, layering up where needed. For those eagle eyed Polkadoodlers you'll notice this is a mirror image - I printed the papers on the wrong side! Kerry - I’ve used allsorts of techniques on here, paper piecing, stamping and clear embossing, which I hope you can see on the pink card. All papers are from the Sugar Birdies CD. 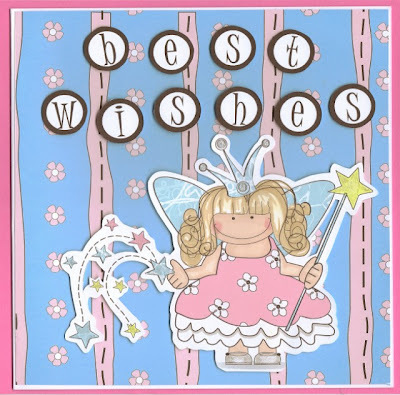 Fliss : For my card I've used a mix of 2 CDs, Back to Nature and Love and Cherish. The sweet image and green paper plus the cut out flowers and grass all came from Back to Nature and the pink polka dot paper from Love and Cherish. I just printed the image on to the pink and green papers and cut out parts for the paper piecing. The rest of the image is coloured with Promarkers. The flowery paper and around the image were done with the Polka Doodles Daisy Doodles stamp set and my own Millefiori stamping technique. 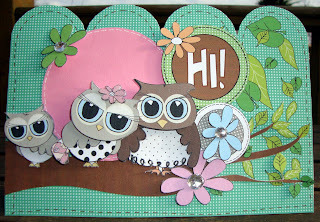 For a tutorial on how to do this please see the sidebar on my blog. Kate: I have used several cds for this one , i love how all the cds can be mixed together on one project and still match !- Polly was on jingle jangles , her wings from papers on back to nature and her dress, alphabet and the main background from candy doodles and sugar birdies (I think). 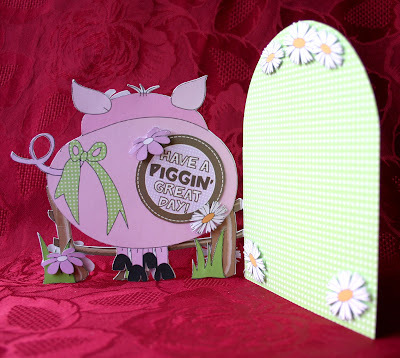 Dolly: I've used pink and white spotty and stripey papers from Love and Cherish and paper pieced Sherman the pig stampie from Back to Nature. The alphas are from Back to Nature too. Brenda I used the Back to Nature CD, taking my colour theme from the stripy paper, machine stitched one panel for the piercing and coloured two images with Copics and decoupaged. The two flowers are made from plain white paper and striped with lilac Glimmer Mists. 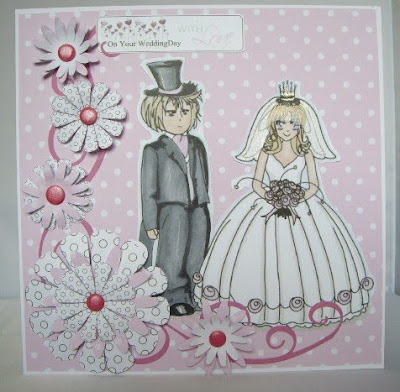 Nettie: I have used this cute topper from the Love and Cherish CD and used the papers from Love and Cherish. I also coloured this little lady in with my Promarkers. 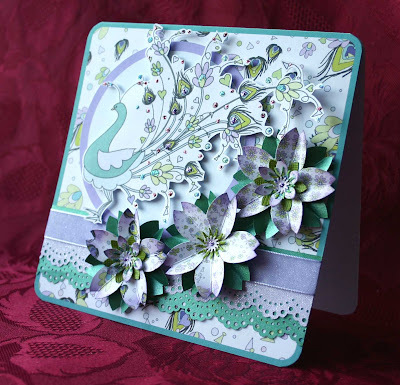 I also have used a few quilled flowers to embellish my card. Looking forward to popping by and seeing what you have been creating this week!